Virgo March 2017 Horoscope forecasts a month of changes and transition. March 2017 will be a month of intense and faster transformations in life for the Virgo zodiac sign. Change will remain a constant factor for some time to come and will bring you better things in life. 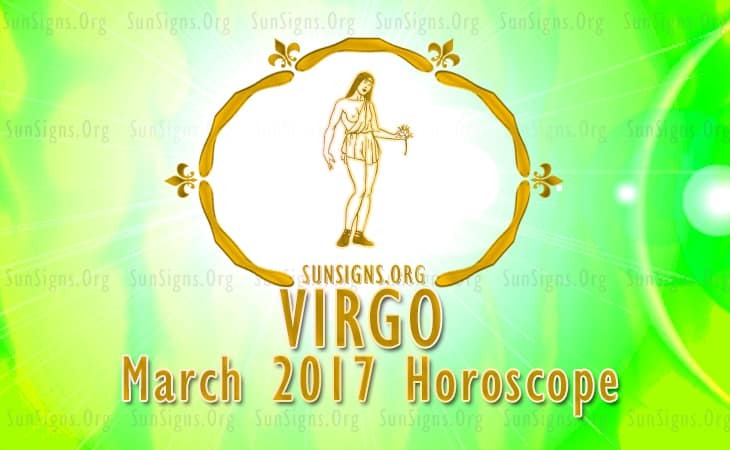 Virgo, your ambitions and success in career will dominate over emotional concerns and domestic issues in the month of March 2017. You should follow your professional objectives vigorously. And you can follow your own course without depending on others. The March 2017 Virgo monthly forecasts predict that the career environment will be excellent. You should be ready to accept any modifications to your job profile or nature of business. The astrology 2017 prediction suggests that major modifications to your financial strategies are required this month, Virgo. You have to decide on your investment and expenditure plans. You should be ready to accept minor setbacks to your income. Interest of others and their earnings will occupy the mind of the Virgo personality this month. You will have the support of the earnings of your life partner to boost your monetary health in March 2017. Though your own fiscal earnings are in the planning stage, overall money flow will be satisfactory. Socially this is a very stimulating month with plenty of socializing and partying for the Virgo born. You will expand your social network with many new entrants in March 2017. Here are a few tips to avoid a hangover. Love relationships will govern your life in March 2017, Virgo and they are subject to constant change. You and your love mate are seeking more freedom in your alliance and do not want to be tied down by children or pregnancy. Present relationships will break and new ones will be made. There is no permanency in relationships and love. Here are a few tips from successful online daters. Planet Venus and planet Mercury are present in your House of Love. Single Virgins will get plenty of chances to get into love relationships. Confirmed relationships are unlikely and you are always on the lookout for new love companions. The March 2017 for Virgo zodiac also predicts that you health will be troublesome till the 20th and can be improved with more breaks. Your vitality will improve enormously after that. Emotionally, you have to keep your balance during the month. Test your EQ here. The Virgo horoscope for March 2017 forecasts a period of excellent money and career but there are no chances of serious love relationships.